A big reason that underwater treadmill hydrotherapy is so effective is that the water provides buoyancy. We all weigh less in water because our bodies tend to float. This is no less true for a dog or a cat. In the case of hydrotherapy, the buoyancy of the water allows patients to exercise their muscles and joints without their own body weight putting pressure on their sore points. If a pet has a sore or weak leg, he will bear more weight on that limb in water than on land. Over time, muscle mass is gradually increased without the discomfort and muscle stress that can sometimes come with traditional land-based physical therapy. This makes underwater treadmill therapy an excellent treatment option for many musculoskeletal conditions, as well as for post-operative therapy. Used in conjunction with a proper weight management diet, underwater treadmill therapy also offers an effective option for weight loss – particularly for older pets. In this case, it’s the resistance of the water that’s important. Water resistance increases metabolic demand – which burns more calories and improves muscle strength. Underwater treadmill therapy can also be a wonderful exercise for animal athletes. This type of controlled training helps to build and maintain muscle and strengthen the core. Walking speed can be increased to running speed and changing the water level increases the resistance. This offers a more challenging workout, without any undue stress on the joints. The result is increased endurance, increased cardiovascular capacity, increased flexibility, and stronger muscles – all of which reduce the chances of injury. 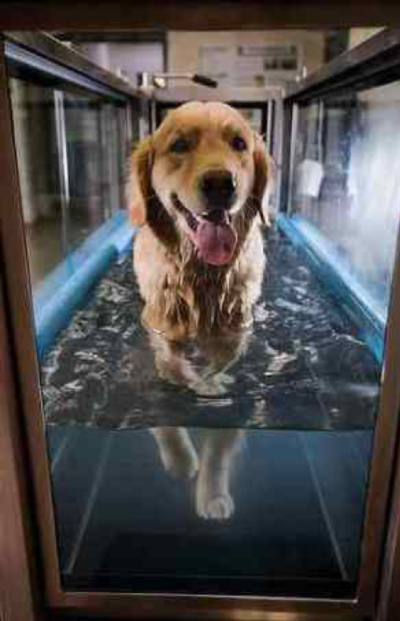 The intensive conditioning offered by a water treadmill can be helpful to keep older, arthritic dogs moving and athletic dogs in peak performance – especially offseason. If you think your pet may benefit from underwater treadmill therapy, please contact us at Animal Care Clinic for more information. In addition to hydrotherapy, we offer physical therapy, physical manipulation, therapeutic laser, and more – all of which may improve your pet’s quality of life. Let us help you to help your pet!